I'll be honest, National Burger Day is one of my favourite days in the year, even though I'm at work and don't get to go hunting for lots of burgers like some of my friends. Luckily however, I do work in Brixton which is a seriously great place for food, so I knew I'd at least get one good burger out of today. As soon as lunch hit, me and Broonylou made the decision to head to Dip & Flip, a restaurant I had seen lots of adverts for in Brixton station. We really had no idea what to expect, apart from by the looks of the adverts there would be a lot of gravy involved (which if I'm honest sold the place immediately to me). Heading inside we were already getting more excited, the decor of the restaurant was really cool lots of quirky decorations and artwork, I particularly liked the big graphic that's pictured above. We grabbed a table, placed our orders and waited for our food, as soon as we started seeing other peoples' food head out we knew we'd made the right choice, in a word the food looked amazing. We also couldn't stop staring at the 'Dipping Station' and the chef's uniform telling us whether they were the Dipper or the Flipper, the entire restaurant looked well organised and exciting, they even had a DJ system set up in one corner! I ordered the Chilli Cheese Burger (£7.50), but as I'm super fussy, I pretty much changed it all, swapping the cheese for onions, and the other dressings for salad. Now, usually when I head to 'fancier' burger joints I feel terrible about changing their set burgers so much, however they were amazing about it and even managed to find me some salad which they don't normally have apparently! 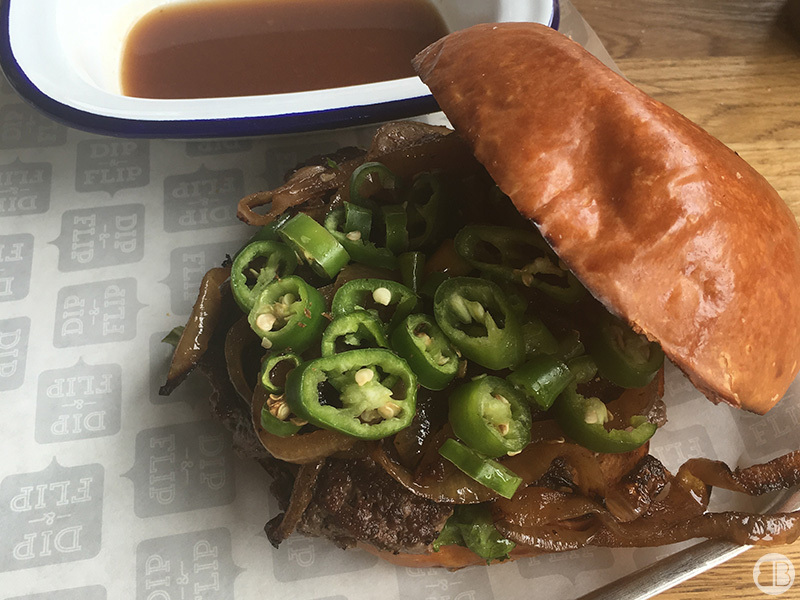 The other amazing thing was the fact the burger contained a lot of chilli, which is a rarity, so for a burger to show up with a mountain of them inside was incredible, I've never had that many even when I pay extra to get them at other places! The burger itself was cooked to perfection, the waitress asked how we wanted it cooked otherwise it'll come as Medium (which is a standard for many decent burger restaurants), it was super juicy and just melted in your mouth. All stuffed inside a delicious freshly baked bun, it was just perfection in every single bite! I should mention here that all of the burgers also come with a little tray of gravy, which was a nice surprise as I thought you needed to order it separately if you wanted it with the burgers. 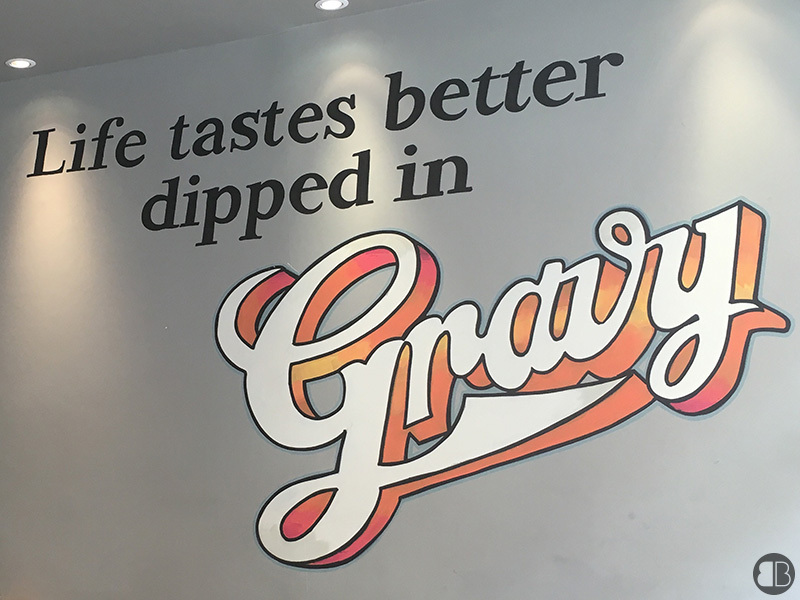 I can definitely agree with the sentiment that everything does taste better dipped in gravy. Along with the burger, I had a Vanilla Milkshake (£5.50) which was thick and creamy and absolutely amazing. Vanilla milkshakes are my all time favourite, so they are always a must try whenever I try out a new place, as if they can make such a delicate flavour taste great it'll seriously impress me. Luckily for them, it was one of the best vanilla milkshakes I've had in a long time, and the fact it comes served in the tin with a straw is just brilliant. 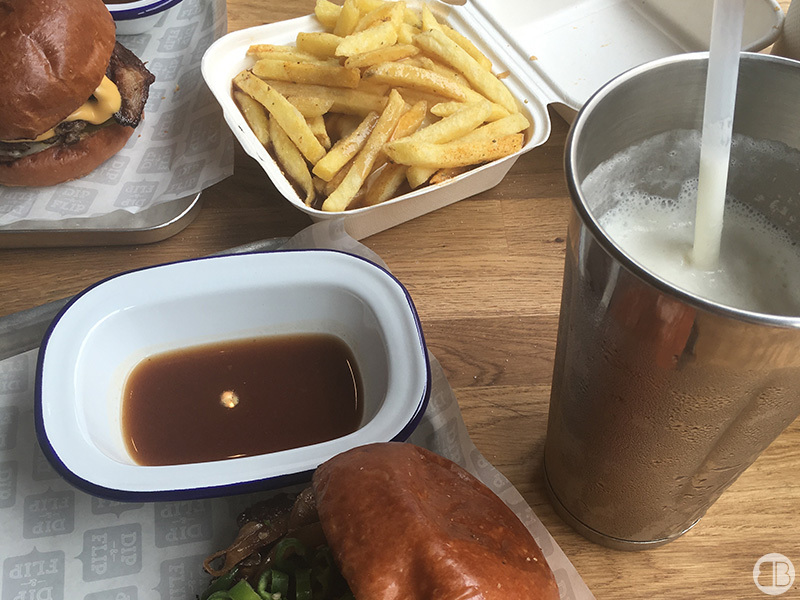 We also ordered a side of Cheese, Fries and Gravy (£4.25) to share, which again tasted as incredible as the rest of the meal were my least favourite item of the three (but that's just because I was super full and decided to finish the milkshake instead). Fries that remained with a little crunch despite being drowned in gravy and cheese is just a testament to how perfectly they were cooked, which allowed us to enjoy them at their very best. All in all, the total bill hit just over £30 for the both of us, which is a total bargain when I think of the quality of the food and drink. I highly recommend the place, and despite only having been to the Brixton branch, I would guess the other branches are of the same high quality and will likely get a visit from me also in the future! Did you celebrate National Burger Day? Where did you go and any recommendations for me to try? !